(Bloomberg) -- The trade war between the U.S. and China comes back into focus this week as U.S. negotiators head to Beijing for another round of talks. While President Donald Trump said last week that a deal is “close,” aides have downplayed the prospect of a swift conclusion to the spat which is overhanging the world economy. The two side are reaching a critical stage with discussions on the toughest issues like intellectual property protection. Trade Representative Robert Lighthizer, who is leading the talks for Trump, and Treasury Secretary Steven Mnuchin are among those heading to China for meetings on Thursday and Friday. It’s a packed week of Federal Reserve speakers as they seek to detail their outlook in the wake of last week’s decision to signal no more interest rate hikes this year. Governors Randal Quarles and Richard Clarida speak as does New York Fed President John Williams and a host of other regional central bankers. The biggest indicators arrive Wednesday with the monthly trade balance and on Friday with personal income and spending. The European Central Bank’s entire 6-member Executive Board will speak at different occasions this week, including President Mario Draghi. 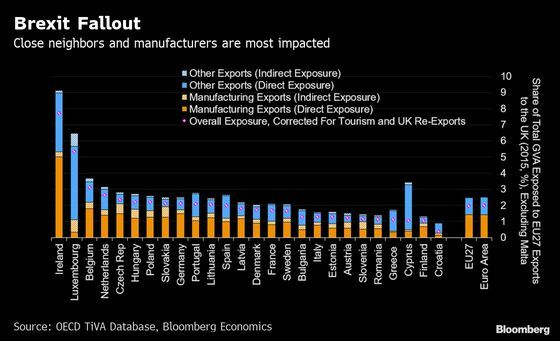 Those pronouncements have the potential to take center stage at a time when the risk a no-deal Brexit is looming large over the region -- more so in the British economy but also in the wider euro zone. South Africa may be able to hold onto its last investment-grade credit rating on Friday, but the commentary from Moody’s Investors Service is unlikely to be good and it probably won’t be long before the company pulls the trigger. Policy makers in Hungary may raise interest rates on Tuesday while counterparts in the Czech Republic, Nigeria, South Africa, Kenya and Egypt also meet to set policy. Policy makers from Latin America’s two largest economies are increasingly expected to signal that interest rate cuts are in the pipeline. On Tuesday, investors will be scouring the minutes of the Brazilian central bank for signs of possible monetary easing in the second half of the year. In the first meeting under new chief Roberto Campos Neto on March 20, the bank held borrowing costs at an all-time low while acknowledging Brazil’s economic recovery has disappointed. On Thursday, Mexico’s central bank will likely keep its benchmark rate at a decade high but may signal it’s ready to cut it for the first time since 2014 as growth slows. Chile’s policy makers meet on Friday. Two forums will dominate the newsflow -- the weekend’s China Development Forum followed by the Boao Forum. People’s Bank of China Governor Yi Gang speaks at both. Trade and the global economy’s wobbles will be among the main topics of conversation at a time when the world’s second biggest economy may be stabilizing. New Zealand’s central bank will decide on interest rates, with the long hold on rates since 2016 seen continuing. 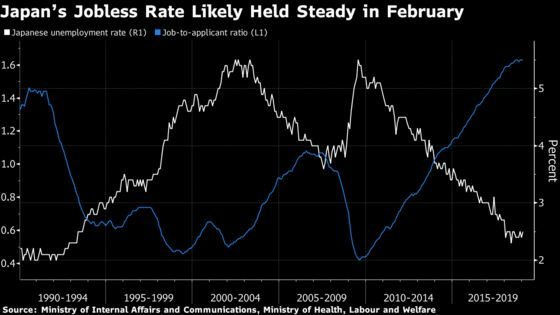 On Friday, a raft of Japanese data including jobs and retail sales will be closely scrutinized. Any further weakness may add fuel to a recent debate over whether the Bank of Japan needs to rethink its optimistic 2 percent inflation goal.